From Screencheat studio Samurai Punk. 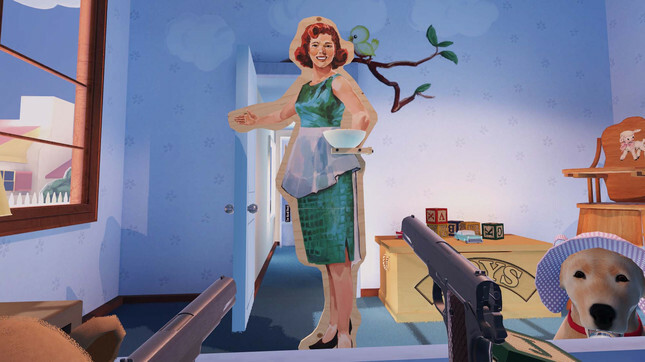 Samurai Punk today released The American Dream, a satirical virtual reality trip through a 1950’s world’s fair where you learn to live your life with guns. It is the second game from the Melbourne-based indie, following cult "second-person shooter" Screencheat. In The American Dream, guns are used for all manner of things, including eating meals, driving cars, and working a day job. Oh, and your guide through the game's 20 level narrative is Buddy Washington, a talking dog. "With weapons ranging from pistols to rifles and shotguns, you’ll learn how guns will take care of all your day-to-day needs!" the game's pitch reads. "Journey through the life of an Average American and learn how guns can help you through key moments in life." Check it out for PS VR on the PlayStation Store, or for Oculus Rift and HTC Vive on Steam. Note: the price of the PS VR version was accidentally set much too high, but Samurai Punk is working with Sony to change it.